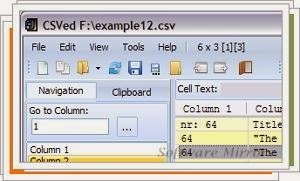 There are many CSV files that are used professionally and privately. These are documents created to represent the data in a table format. However, it is a problem and very time consuming to modify such tables. But with CSVed this task is very easy now. CSVed has been designed to edit every single element of a CSV document. In addition to cut, copy and paste the content already exists, this application can also insert new values ​​and rearrange columns and rows. The main advantage of CSVed is the simple user interface that underlies an efficient system that fits each comma-separated value quickly and easily into a table. Download CSVed now and discover how easy it is to deal with CSV files.